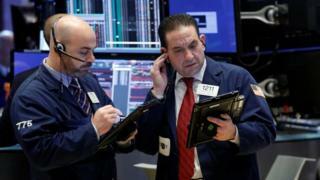 US stocks broadly ended flat as investors awaited an important monthly jobs report on Friday. The Dow Jones Industrial Average gained 0.01% to 20,858.19 while the broader based S&P 500 rose 0.08% to 2,364.87. The tech-heavy Nasdaq Composite was up 0.17% at 5,847.39. Investors were feeling tentative ahead of the February nonfarm payrolls report, which will provide a snapshot of the US economy's health. Analysts expect the jobs figures to beat expectations, increasing the likelihood of the Fed raising interest rates next week. Shares in oil firms rebounded despite a further 2% fall in the price of West Texas Intermediate crude to below $50 a barrel. The S&P 500 energy index climbed 0.6% - ending a two-day losing streak - with ConocoPhillips and Exxon Mobil gaining 1.2% and 0.79% respectively. Financial stocks slipped with the S&P 500 financial index ending 0.3% lower. It came after the White House confirmed Donald Trump still backed a campaign pledge to restore the Glass-Steagall Act, which separated commercial and investment banking, but was repealed in 1999. JP Morgan lost 1.11% and Goldman Sachs ended flat, although Bank of America and Wells Fargo gained 0.36% and 0.84% respectively.